AMUEEE abbreviated as Aligarh Muslim University Engineering Entrance Examination is a university level entrance examination conducted by the Aligarh Muslim University, Uttar Pradesh. The entrance examination is conducted to check the eligibility of the candidates wailing to seek admission in engineering domain. AMUEEE is conducted every year in the month of May through offline mode. The examination authorities have established various examination centers in various parts of the country to make it an ease for the candidates to appear for the entrance examination. Aligarh Muslim University releases the schedule for AMUEEE 2019 through its official website. The important events and their schedules related to the entrance examination are mentioned below in the table for the applicant’s reference. The eligibility criteria for AMUEEE 2019 are based on the factors like age, qualification, score, etc. Aspirants should fulfill all the eligibility criteria to appear for the entrance examination set by the admission committee of AMU. Age: Candidates should be of 17 years (minimum) of age as on 31st December 2019 to appear for AMUEEE 2019. Nationality: Aspirants appearing for AMUEEE 2019 should be the citizen of India. Qualification: Candidates will have to attain 50% aggregate in 12th in mandatory subjects like Physics, Chemistry and Mathematics. AMUEEE 2019 application form will be available from February 2019 through its official website. Candidates can apply through online mode for the entrance examination by filling the application form and making the payment online. Create the Profile: Aspirants will have to create their profile by registering themselves using user name and password. Upload the documents: Candidates will have to upload the scanned copies of recent passport size photograph of the candidates, signature and left thumb impressions. Enter course and academic details: Candidates can then fill in the details of previously qualifying examination. Pay the application fee online: Payment for the same can be made through net banking/credit card/debit card. AMUEEE 2019 exam pattern will be finalized by the admission authorities of the Aligarh Muslim University. The exam pattern comprises of various aspects like duration of the exam total marks allotted, subjects, marking scheme etc. Mode of Examination: AMUEEE 2019 will be conducted in offline mode (pen and paper based). Medium of Examination: AMUEEE 2019 will be conducted only in English language. 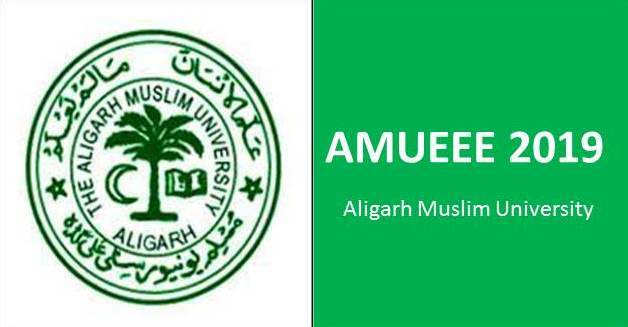 Exam Paper Format: Aligarh Muslim University has designed AMUEEE 2019 question paper in multiple choice formats. Each question will consist of 4 options out of which candidates will have to choose the correct answer. Duration of Examination: AMUEEE 2019 will be conducted for 3 hours i.e. 180 minutes. Subjects: AMUEEE 2019 examination will be for 3 subjects, i.e. Physics, Chemistry and Mathematics. Total Marks: AMUEEE 2019 will be held for 150 marks. Each question carries 1 mark.? Marking Scheme: In AMUEEE 2019, every correct answer will fetch 1 mark and every wrong answer will deducted ¼ marks. There will be no negative marking for unanswered questions. The admit card for AMUEEE 2019 is been released through online mode via their official website. The admit card will be released for the candidates who successfully completes their registration process. The candidates should carry their admit card to the examination center. Visit AMUEEE 2019 official website and navigate to Admit Card link. Select the applied course and provide your transaction Id. Click on submit option and take the printout of the admit card. Venue Details of the examination center. The admission committee of Aligarh Muslim University declares the result of AMUEEE 2019 through its official website. The candidates can check their score and download their rank card by logging in with their registration Id and Password. Visit the official website of the AMUEEE 2019 and navigate to link Results. Login with the required credentials and click on submit. Once the result is displayed download and take the printout of the score card for further usage. Counseling for engineering course admission at Aligarh Muslim University will commence soon after the declaration of AMUEEE 2019 results. The counseling will be conducted for those candidates who qualify the entrance examination. 5 Recent Passport Size photograph of the candidate. Aligarh Muslim University has established its exam center in various parts of the country. The candidates will have to choose 2 or 3 exam center according to their convenience while filling the application form. In the below mention cities engineering entrance examination will be held.